BB—that’s what we’re calling Bread Baby these days—seems a little … slow. Like any new parent, I find myself worrying that I’m not doing it right—not feeding BB properly, not keeping BB warm enough, not adequately attending to BB’s needs. BB was being attacked by fruit flies, so I brought her to work with me. Unfortunately, the fruit flies followed, and I went a little crazy because I kept seeing them in the corner of my eye. Mama Bear and her clappety-clap hands to the rescue. Goodbye, fruit flies. She’s not growing as quickly as the other bread babies I see (damn you, social media, and your unattainable standards! ), and I’m concerned that I’ve somehow stunted her growth or failed in some other monumental way. I think I’m doing what I’m supposed to be doing. I’m trying out a combination of education and intuition. Still following Maurizio’s recipe, but also trying to tune in to the art of it; sensing when BB’s too wet, too dry, grown well overnight, not really grown, etc., and adjusting her feeding schedule accordingly. The problem is, when you boil it all down (the process, not BB, you monster), I have absolutely no idea what I’m actually doing. I’m winging it. I’m throwing stuff into the bowl, giving it a stir, and hoping for the best. She seems to be doing … sort of … well, though, as I said before, not as quickly as I had hoped. I’ve upped her to two feedings a day, even though she didn’t look like the pictures Maurizio posted to show when it was time to increase feedings. What can I say? I’m going with my instinct—even if my instinct might be completely wrong. I’m trying to accept BB for who she is and let her find her own way, and I think she’s responding well. She’s started growing a bit more (she made a huge bubble overnight! ), and her smell isn’t as … off-putting as it was last week, when she emitted an odor of vinegar and … something not nearly as pleasant. Was last week perhaps her pre-pubescent phase? Should I have talked to her about her changing body and discussed deodorant and proper hygiene? Even without the birds and the BBs talk, she’s managed to improve her scent somehow. She’s more vinegar, less piss. A lot less piss. Perhaps her adolescence is over. How do I know when she’s ready to go off on her own and make bread? 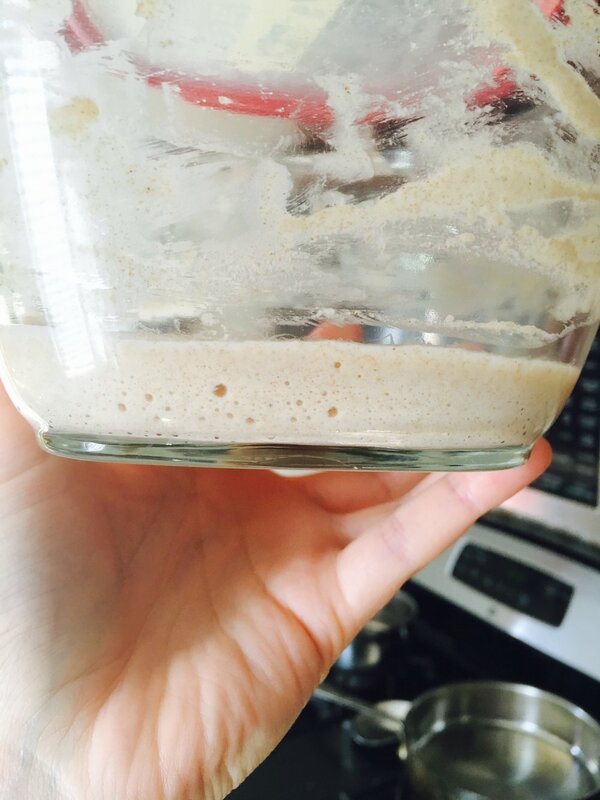 The books say it takes a week for a sourdough starter to be ready for that. But she’s just now barely started showing a real rise during the day (something Maurizio said should happen by Day 5 or 6). And I haven’t done any triple feedings, either. Do I wait for that stage first? I also think BB needs a different container. I think the one I’m using it too wide. She has to work doubly hard to spread out and then rise, instead of putting most of her energy into just rising. I don’t know if I’m very good at this. And I'm a little worried that BB is developmentally challenged.